Hello all! Welcome back! 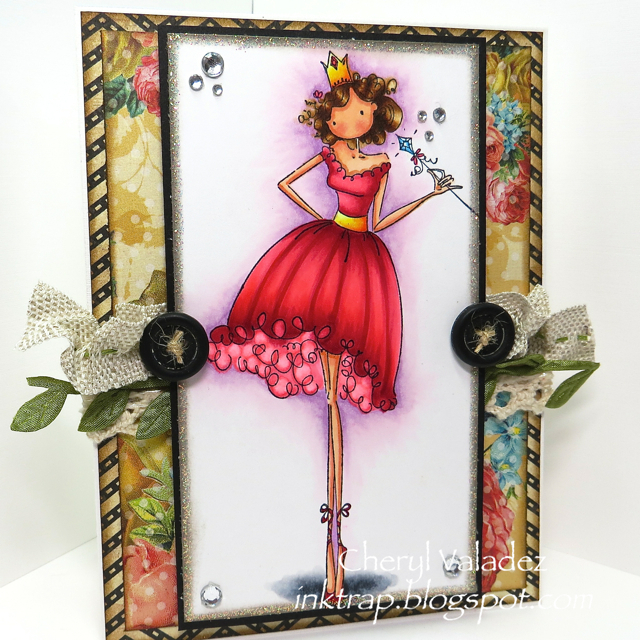 Today I'm sharing a card for Bellarific Friday at Stamping Bella. 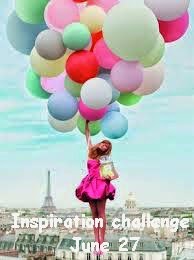 This time we were asked to create a card using this inspiration pic you see above. Immediately I was drawn to the colors on her vivid dress so that was the direction I went in. I used Uptown Girl Faith the Fairy. You can find her in the Stamping Bella Shop along with all her sassy Sistahs. Be sure to visit Blogabella so you can feast your eyes on the glorious creations from the design team. So much wonderful stuff to see! Speaking of design teams...I have decided to take the Summer off. My husband and I own a small BBQ Sauce and Spice Rub business, AlbuKirky Seasonings, and when the weather gets warm that's our time to shine. Grilling/smoking season is in peak swing right now so we are up to our barbecue aprons in pork butts, ribs, briskets, chicken, and anything else you can toss onto hot coals, or into a smoker box. Kirk has been demoing at as many stores as he can and we've been hitting the local Rail Yard Market every Sunday to sell our wares. This weekend he'll be at a video shoot for Disc It. A Disc-It is like an outdoor cooking wok and we LOVE ours. Anything you can cook on top of the stove, you can cook outside on a Disc It. Needless to say, I'll be blogging a lot more on his cooking blog. You see, the one thing I love more than Copics, paper, stamps, buttons, ribbon, etc...is cooking, particularly baking bread. There is no better feeling than sitting down with family and friends and sharing a meal that you created from scratch with them. It's a culinary love letter letting them how important they are to you. I'll be popping in from time to time with a card, but probably not with any regularity. When Summer fades and gives way to cooler weather you may see me apply for some teams, but in the meantime you'll find me in the kitchen :) Visit me at AlbuKirky Seasonings, the Blog. Lovely card, very girlie and stylish. I will miss your cards this summer and hope that you will be able to create something from time to time. Good luck with your business! Love your card Cheryl but wanted to wish you and Kirk an awesome summer with lots of business! What a beautiful card Cheryl! I understand that life gets in the way of stamping and wish you well with the barbecue business...there's nothing better than a barbecue in the summer! Have an amazing summer, Cheryl!!! I'll miss seeing your gorgeous creations, but I'll be watching your food blog!! Best of luck to you and Kirk! Big hugs!